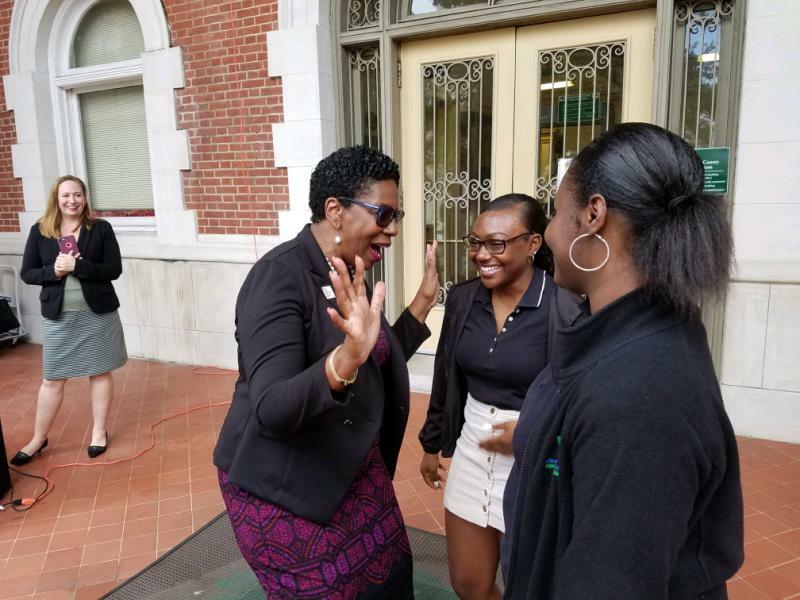 Savannah-Chatham Schools Superintendent Ann Levett talks with Savannah Arts Academy seniors Rishe Williams (center) and A'lani Coppock after announcing the district's partnerhsip to encourage FAFSA completion. Savannah schools are partnering with the University System of Georgia to help more students apply for financial aid for college. Filling out the Free Application for Federal Student Aid — or FAFSA — is a key step for students and families trying to figure out how to pay for college. The state university system says nine out of 10 students who finish the process end up enrolling in college. Savannah Arts Academy senior Rishe Williams said the FAFSA is “daunting” but exciting. “It really helps us to know that we’ve got people behind us that are willing to help us and willing to give us the financial aid that we need,” she said. Williams hopes to study dance and civil engineering at Howard University or Point Park University. Savannah-Chatham County Schools Superintendent Ann Levett said the goal is to help students like Williams graduate from college with as little debt as possible. "We typically talk in terms of loans," she said. "But we also want to acquaint them with scholarship opportunities (and) grant opportunities that are also sometimes very dependent upon having this process completed." USG and the Savannah-Chatham County Public School System are holding outreach events and offering help to get more families to apply for financial aid. The project is being funded by a $40,000 grant from the National College Action Network.